We get a look at the carnage in and around the diner as the gunfight continues. Esai's friend the sheriff was shot in the head! Reid's badly injured, but sees the real killer, Anders, walking calmly along the sidewalk, because the guy's too dumb to worry about stray bullets! Naturally he finds this peculiar, but is he too injured to share his suspicions? Derek - who was only hit in his vest - shakes off the cobwebs and helps JJ shoot at the preacher. Who runs out the back door of the diner, because no one bothered circling around the building! Jeanne goes to check on Reid, and notices that he's losing a lot of blood from his neck wound! She tries to hold his attention and convince him to stay awake, but it doesn't work! This might have something to do with the fact that she calls him 'Ethan', which is not his name. Is that like a pet name that she has for him that I've forgotten about, or is she conflating him with someone else who she lost in a tragedy? Whatever the reason, it's super-weird. JJ and Derek have a foot chase with the preacher, eventually following him into an abandoned building and killing him! Despite the fact that they're both wearing ear radios and microphones, they don't update the cops on their position as they race through backyards and hovels. Despite this oversight, the cops still manage to rush into the room with them less than ten seconds after they kill the preacher. 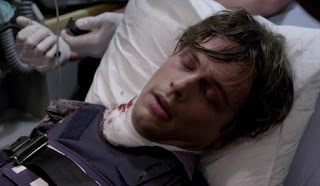 In the ambulance Reid start babbling about a tea kettle, but then he loses too much blood pressure and starts to crash. Was he trying to send a message, or was it just rambling? Also, I'm not a medic, but shouldn't they have cut that vest off of him to ensure better access to the whole wound area, rather than just removing one strap? It's held on with elastic straps and velcro, you could get it off in like three seconds with your clothes scissors. Notably, when Derek also demands that Reid 'stay with him' he uses Reid's actual last name. Will that prove more effective? Hopefully we'll find out after the credits! Posted by Vardulon at 2:50 AM 0 "comments"
Posted by Vardulon at 2:11 PM 1 "comments"